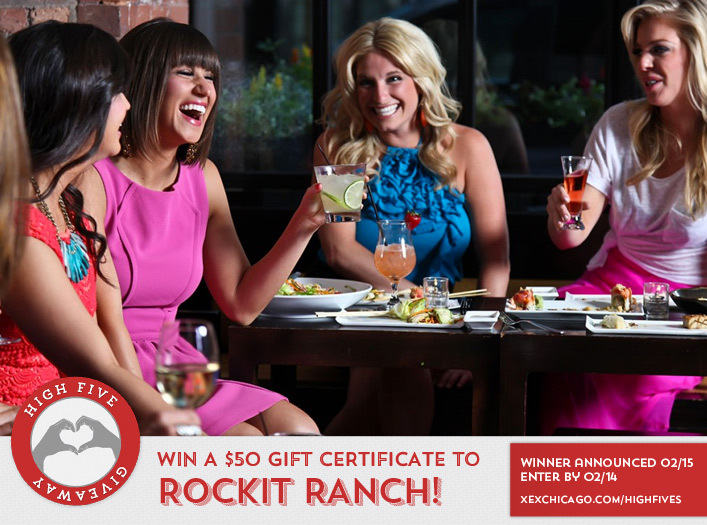 Win a $50 gift certificate to Rockit Ranch! Congratulations to Ashley Scott on winning our 149th High Five Giveaway and thank you to all who entered! Our next High Five Giveaway is for a $50 gift certificate to Rockit Ranch. The gift certificate is good at any of their restaurants, including Rockit Bar & Grill, Rockit Burger Bar, Sunda New Asian, Underground, The Duck Inn and Bottlefork. Located in the heart of River North, Rockit Bar & Grill showcases Executive Chef Amanda Downing’s contemporary culinary twist on traditional bar and grill fare. Visit the Rockit web site at www.rockitbarandgrill.com. Located across from historic Wrigley Field, Rockit Burger Bar offers chef-driven cuisine in a party atmosphere. Visit the Rockit Burger Bar web site at www.rockitburgerbar.com. Sunda New Asian is an award-winning restaurant at the vanguard of America’s New Asian movement showcasing Eastern Asian and Southeast Asian regional cuisine. Visit the Sunda New Asian web site at www.sundachicago.com. Situated on the border of Chicago’s booming Pilsen and Bridgeport neighborhoods, The Duck Inn is housed in a pre-prohibition era tavern and showcases Michelin Rated Partner/Chef Kevin Hickey’s signature New American cuisine. Visit the Duck Inn web site at www.theduckinnchicago.com. A modern American restaurant and bar where the bar and kitchen come together to create the perfect marriage of food and drink. Visit the Bottlefork web site at www.bottlefork.com. Now, just add a comment to this post with the right answer to be eligible to win! The winner will be announced on Monday, February 15. Entries must be received by midnight on Sunday, February 14. February 14th! On a Sunday this year. Valentine’s Day is on Sunday, February 14, 2016! Valentine’s Day this year is on Sunday. The date is February 14th! February 14th. On a Sunday this year. Valentines Day is Feb. 14th, a Sunday this year. Sunday, February 14, of course! Valentine’s Day of 2016 is Sunday, February 14th . Valentine’s Day is February 14th! Xex is the best! Valentine’s Day is Feb 14, 2016 – today!